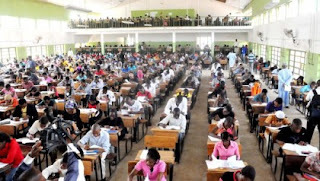 The Joint Admissions and Matriculation Board (JAMB) has set in motion sound mechanism in preparation for the successful conduct of the 2016 Computer Based Test Unified Tertiary Matriculations Examination (UTME) as staff of the Board undergo various training at different levels to keep them abreast of the latest development regarding conduct of 2016 UTME. Addressing the 2016 CBT technical staff of Board, the Registrar and Chief Executive of the Board Prof. Dibu Ojerinde emphasised the need for all staff to abide strictly by the laid down rules and regulations stipulated to guide the conduct of the 2016 UTME. The Registrar said, “CBT is flexible but not lawless, therefore, all hands must be on deck to ensure a successful conduct of the Computer Based Test (CBT) that is credible and of standard international practices”. Prof. Ojerinde insisted that the 2016 UTME will no longer be business as usual, as candidates will no longer be allowed to sit for the CBT examination thirty minutes (30 minutes) into the examination time adding, candidates who missed the examination for whatsoever reason will no longer be rescheduled. “We should strive to do things the way it is done so that we will measure up with international standard”. He added. He also pointed out that candidates would no longer have the luxury of changing their subject combination during examination as candidates had been given ample time to do so at no cost before the website was closed for registration. The Registrar enjoined staff to perform every duty assigned to them with utmost integrity, as integrity is everything. He advised staff to ensure that they are security conscious during the examination, he stressed that “bunching” should be avoided at all cost in all the centres to avoid security hazard. Candidates should be made to form a single line as soon as they arrive at their respective centres and ensure that they are made to stay in the holding room/hall before they are arranged in their respective seats.